Learn to choose the right chainsaw to meet your needs. Maintaining a garden in a residential property doesn’t require a lot of machinery, but there is one product that can be a necessity in gardens with large trees and hedges — a chainsaw. While some homeowners would prefer to call in a specialist to deal with problem trees and large-scale pruning, others require the perfect chainsaw to handle the job themselves. Husqvarna chainsaws are highly regarded for their performance and features and with a little bit of know-how you can learn how to select the ideal option to meet your needs and budget. The problem for new users is that the task of picking the right chainsaw can be quite daunting. This guide to the best Husqvarna chainsaws for residential properties will look at the reputation of this leading company and some of important factors to consider when buying a chainsaw. It will then look more closely at the features of the Husqvarna Landowner range and the different models available to help you make your choice. Husqvarna, as the hard-to-pronounce name suggests, is a Swedish company. They are currently based in Stockholm and a clear leader in Europe, but their success has taken them worldwide with ventures into the American and Asian markets. When Husqvarna says that it has been making a diverse range equipment for a long time, they are not exaggerating. This isn’t a family business simply continuing the old ways of grandparents or great-grandparents; this is a business that has been developing products since 1689. It all began with rifles and other firearms, there was a period in the 1800s when sewing machines and kitchen equipment became best for business and then the 1900s saw the steady rise in outdoor equipment and power tools that has made the company famous today. It wasn’t until 1959 that the first chainsaw was created, quite late in the company’s life, but this has remained an important focus. 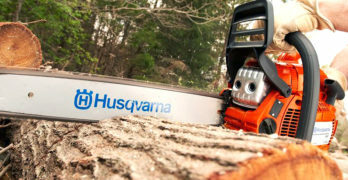 The creation of a remote-controlled demolition robot in 2009 may have taken Husqvarna into exciting new territory, but the focus on chainsaw development and production has not diminished and they are still seen as a top chainsaw manufacturer. The rise of Husqvarna has ensured that they are one of the most high-profile, respected brands in the market. Husqvarna has created a global brand with this diverse range of professional and domestic equipment and it continues to provide mowers, chainsaws, stone cutting tools and other agricultural products to leading companies and professionals across the world. There were a number of expansions and acquisitions around the turn of the 21st century that helped to cement the companies position as a world leader. If you proudly cut your lawn with a Flymo lawnmower, you are using a product by a brand owned by Husqvarna. Or, many people don’t know this but Husqvarna also owns the Poulan Pro and Poulan brand of chainsaws. Husqvarna also bought American lawnmower maker Yazoo/Kees in 1999 and expanded into the Chinese market in 2008. Husqvarna began making a wide range of products. This focus, development and history has resulted in a great deal of respect for this company and buyers continue to turn to them for high-end, reliable cutting equipment. Many industry experts feel that this reputation as a leading brand has been earned due to the reliable performance of the machines, the development of great features and the products’ durability. This is why so many professionals turn to Husqvarna. Another reason why Husqvarna gets so much love and adoration from consumers is the fact that the company is often ahead of its time. Robotic, solar-powered lawnmowers sound like something we would have expected to see as a showcase piece in today’s market but Husqvarna came up with their own version as long ago as 1995. By choosing a Husqvarna chainsaw, professionals and homeowners can find a great model that suits their needs. Needs have obviously changed since the 1950s when the first model was devised. At the time, forestry was a bigger deal and the demand for powerful chainsaws and other cutting equipment came from professionals. 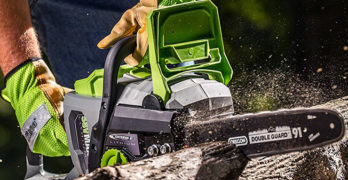 Today, the company has a diverse series of chainsaw lines to cater to different needs and there are just as many user-friendly models for residential use as big, powerful options for those that fell trees for a living. The company proudly boast that “a Husqvarna chainsaw will be your reliable partner no matter what forestry challenges you’re facing” and it seems that this is the case. Professionals may still be felling massive trees in the forests, but there are also many homeowners dealing with domestic problems on a smaller scale. This is where the inclusion of the Casual, Landowner and Electric series of chainsaws come in. These lines offer lighter, user-friendly saws for lighter work and provide plenty of options for buyers. The problem with having so much choice, however, is that it can be difficult to know precisely which model to buy. Before looking more closely at some of the models in the Landowner range and comparing their specifications, it is important to get a better idea of what to look for in the ideal chainsaw. Three important considerations that you may have overlooked as a consumer. An important factor that buyers tend not to consider when searching for the perfect chainsaw is the tree that it will be cutting. It is easy to get tempted by big machines with large motors and long bars because they look the part, but you have to match the product to the job. A long, tough bar is a necessity with hardwoods and large trees if you want the most efficient performance, but it could be overkill in some domestic situations. If you are just pruning a big hedge or a few softer branches, go for something lighter and easier to maneuver to save a lot of hassle. Husqvarna 445 : For most homeowners, this is the perfect gas chainsaw. Is the chainsaw easy to maintain? Be honest. Are you the sort of person to grab the chainsaw out the garage, carry out the job at hand and then throw it back where you found it without a second thought? Is the chainsaw that you buy just going to sit there in your garage uncared for until the trees or shrubs become a nuisance again? Maintenance and servicing can make a big difference to the longevity of a product and this means cleaning out the filters, checking the chain and replacing the spark plug. If you don’t already know that, even with the best of intentions, your saw is going to be neglected. It might be worth looking for a model that tries to protect itself with better airflow and other low-maintenance features. What about the environmental issues? This does not mean environmental in terms of people protesting about the tree you are cutting down, but rather the impact that the chainsaw has on the environment around you. Gas chainsaws create emissions and Husqvarna chainsaws aim to reduce this where possible to meet local regulations. Then there is also the noise issue to consider. If you have a good pair of ear defenders on, you probably wont notice just how loud your chainsaw is. Your neighbors, on the other hand, could soon be banging on the door and trying to get you to stop what you are doing. Electric chainsaws can be much quieter than Gas ones but they may not be as effective for tough jobs. Try and be considerate in your purchase for the benefit of all concerned. When in doubt, take a look at buyer testimonials. In many cases, the best way to determine whether a specific Husqvarna chainsaw meets your needs is to look at buyer testimonials online. There are two types of reviewer in the world. The first basically shrugs, says “great” and puts 5 stars because they can’t think of any immediate problems; the second writes an in-depth personal account of their experiences, the pros and cons, and actually gives prospective buyers something to work with. If you can find the latter, you can get a great understanding of precisely what the machine can and cannot do — including any issues with the safety features and maintenance — and see if it suits your personal needs. Important features to look for when looking at the best chainsaw models for homeowners. When it comes to buying a chainsaw for the home, there are different factors to consider. The strength and long-term consistency of some of the more professional Husqvarna models are less desirable if you are only using the product occasionally and it is much more beneficial to focus on safety features and ease of use. Some experts suggest opting for the smallest possible model that will still suit your needs. Anything with a guide bar above 18-inches is generally considered to be professional and many homeowners can actually get away with a 12-inch bar for light, occasional use. The most important thing to remember is that you need to feel comfortable and confident enough to use the chainsaw on your own – without the risk of chopping off the wrong branch or a few of your fingers. Many safety features should could as standard these days, such as the kickback protection, brakes and trigger designs, but it is always worth double checking the specifications. Again, read plenty of consumer reviews to get first hand views on the safety and ease of use. If a buyer says that there was a bit of a “shaky start” or that it took time to get the hang of the product, it may not be the best option for nervous newcomers. Husqvarna chainsaw buying chart. Click image for full chart. In the end, it is all about finding the perfect balance between an effective performance and ease of use. Go for something that is too heavy and powerful and it becomes hazardous in inexperienced hands; go for something that is too light and user-friendly and it may not have the strength and effectiveness to deal with the job. 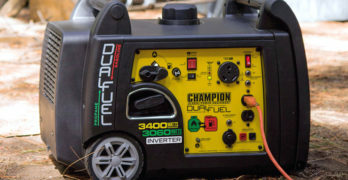 There is a middle ground with chainsaws where consumers can enjoy most of the features of a professional model and a decent amount of power, while also receiving something that is tame enough to be handled with ease. Many models from Husqvarna fall into this category as they are considered to be semi-pro models and the ones that will be discussed below are part of the Landowner range, a range designed for light to medium work with added ease of use. What makes these Husqvarna chainsaws so advantageous over other models? Husqvarna chainsaws have a number of features that are seen across the Landowner range, all of which ensure that the products are well-suited to residential use and easy to use. The most important feature for many buyers is the inclusion of the quick start feature. Experts say that it is 40% easier to start these Husqvarna chainsaws than those of leading competitors. This can make a big difference to users that are lacking in confidence and are a little scared of starting up the chain for the first time. Other important, user-friendly features that are offered here are the inertia chain brake, the felling marks for increased guidance and the “AutoTune” features for an optimal engine performance. The beneficial features in this Husqvarna range do not end there. Another key feature of the brand is the X-torque design that has been created to increase fuel efficiency and decrease emissions. This goes back to that idea of an environmental, neighborhood friendly chainsaw that you can use guilt-free whenever you need it. On the subject of maintenance, meanwhile, there is also the air injection system that helps to clean out the filter and deals with the sawdust in a more effective manner. This can make a big difference because not only does it decrease the time spent cleaning up the mess, it can also extend the life of the product. By purchasing some Husqvarna oil and/or fuel you can extend your warranty. Extend 3 years: Purchase 6 bottles of Husqvarna brand 2-stroke oil regardless of size and/or type at the same time as the qualifying handheld product purchase. Must be on the original product invoice/receipt. Second, the consumer must register their product online. Extend 4 years: Must purchase at least 96 oz of Husqvarna brand pre-mixed fuel at the same time as the qualifying Husqvarna product purchase. Both purchases must be on the original product invoice/receipt. Second, the consumer must register their product online. Now, let’s get to our picks for the best Husqvarna chainsaws for homeowners. There are many similarities between the products in the Landowner range as the designers have ensured that all the models are desirable in their features and their potential to handle the job. As the range progresses, however, there are some smaller differences in the features available and some clear changes in the weight, size and power. Husqvarna quality and still affordable. Nice compact chainsaw. The first model to look at here is the lightest of the bunch, although the company do also say that it is the most popular of the models listed here. This could be partly due to its lower price tag but there is also the fact that it is promoted as the basic model for newcomers and is pretty easy to use. The product description claims that is it “ideal for felling small trees, pruning and other general maintenance on larger properties”. It weighs 10.6 lbs, has a 2.2 Hp motor and can handle bar sizes between 13 and 18 inches. The Husqvarna 435 has a side mounted chain tensioner, meaning you need to use a tool to adjust the chain tension. It’s a little more work when comparing to chainsaws that have tool-less tensioners, but the advantage is it’s a more reliable system. Basically, there are fewer systems to break. Also, it doesn’t have the smart start feature. This could be a problem for some cautious newcomers. View or download the MANUAL for the Husqvarna 435. Rope attachment: A solid point for fastening a rope, allowing you to hoist the saw up into a tree. X-Torq: Delivers lower fuel consumption and reduced exhaust emission levels in accordance with the world´s most stringent environmental regulations. Adjustable oil pump: Control oil flow depending on application and weather conditions. Quick-release air filter: Easy & quick cleaning and replacement of the air filter. Side chain tensioner: Fast and convenient chain tensioning. Quick release air filter cover: Save time when cleaning or changing spark plug or filter. Chain brake window: Enables visibility to the guide bar tip. Air Purge: Removes air from carburetor and fuel system for improved starting. Inertia activated chain brake: Increased safety if kickback occurs. Fast cutting speed + lightweight + tool-less tensioner. Great value. Following on from the most basic 435 model we have the 440E. There aren’t too many major differences between the two machines, it just packs slightly more of a punch. This time the company talk about this being a more general, “all-round saw”, adding that it is “ideal for those looking for a chainsaw that is exceptionally easy to start and maneuver”. This time the product weighs in at around 11.3 lbs, so not a great deal heavier than the 435, and it has a slightly stronger motor at 2.4 Hp and the same bar size. It may not be as popular but these small increases to the capabilities mean that buyers can achieve a slightly better performance with the added bonus of the smart start technology. View or download the MANUAL for the Husqvarna 440E. Great for felling trees and cutting hardwood. Other notable features with this model are the ergonomic rear handle – something that is also seen on the 435 but not the others for some reason – and the fact that it is CARB compliant. Plenty of power but heavy, so make sure you’re physically fit if buying. As we come to the top end of the Landowner range we get to the Ranchers. This is where the comparisons to professional models are really noticeable. The 455 Rancher is promoted as the best option for “part-time users who require a high powered, heavy-duty and responsive workmate for all cutting conditions”. This clearly takes users past the light pruning of a garden to more serious work. This model has the same bar size as the 450 but also a 3.5 hp motor and 15.7 lb. weight. Additional features include the adjustable oil pump, side mounted chain tensioner and choke/stop control. View or download the MANUAL for the Husqvarna 455 Rancher. The ultimate homeowner chainsaw. For experienced users only. The final model to mention here is the larger rancher – the 460. This model is the same weight as the 450 with the same bar size, but there is a little more power with the 3.62hp motor. An interesting side note here is that the ranchers do not seem to have the flip-up tank cap seen on the lighter models. This tank cap adds to the ease of use for refilling the chainsaws. This model does, however, have greater power, an improved grip and a more high-end performance to ensure that it deserves its place at the top of the line. It is likely that this tougher, heavier model is too much for first time users to handle and may be too big for lighter jobs, but it adds to the diversity and brings that professional touch. View or download the MANUAL for the Husqvarna 460. Which Husqvarna Chainsaw is Best for You? As you can see, there are lots of different models to choose from in the Husqvarna range and they each have their individual quirks, pros and potential cons. There is no doubt that Husqvarna is the company to opt for when we consider their strong history of creating these sorts of products, their reputation and the wealth of modern features they have developed. The tricky part is deciding on the best model. Take your time to consider the factors above and to determine what you really want from your chainsaw. When you have a clearer idea of which direction to take, the ideal Husqvarna chainsaw should stand out.